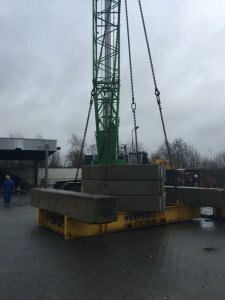 Van den Heuvel Cranes & Services BV distributor of Sennebogen in the Netherlands explored with us the feasibility of an upgrade of a 160 tons Sennebogen 5500 into the 200 tons class. Based on our engineering studies, this type of crane can be made more competitive looking at the crane structure and behavior. We started a feasibility study. This study includes the inventory of the required engineering data, set up of preliminary calculations and an investigation of the weakest crane components. Calculations is one, proofing it by testing is another. The upgraded machine has proven its quality and the proofing test has confirmed that the calculations were executed with great accuracy. Final result, an upgrade of approximately 60% at some combinations of the luffing jib appeared to be possible. The main boom capacities were also upgraded significantly.